U.S. President Donald Trump signs an executive order on U.S. withdrawal from the Trans-Pacific Partnership while flanked by Vice President Mike Pence (L) and White House Chief of Staff Reince Priebus (R) in the Oval Office on Jan. 23, 2017. One of Donald Trump's first decisions as U.S. president was to pullout from the Trans-Pacific Partnership (TPP) agreement. This gives Russia and China a chance to jumpstart talks on setting up free trade areas with Asian partners. 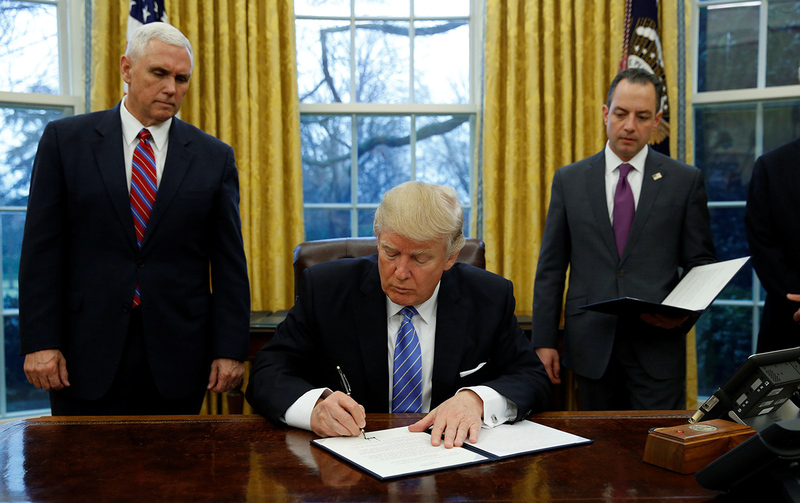 On his first day in office following the inauguration, U.S. President Donald Trump delivered on one of his electoral promises by signing a decree to withdraw the U.S. from the TPP agreement. Trump described the move as a huge victory for American workers. The Trump administration said that reducing the U.S. trade deficit with its largest partners is the primary mission of its new trade policy. In the case of China, which Trump believes devalues the yuan in order to support exports, that deficit exceeded $290 billion over the first 10 months of 2016.
International experts are warning that a unilateral hike in tariffs may backfire on the U.S. Speaking at the Davos forum, World Trade Organization (WTO) head Roberto Azevedo reminded the audience about the risks of the domino effect, when reciprocal tariff hikes result in a sharp reduction in both imports and exports. The World Bank estimates that Russia would have had zero direct economic effect from the TPP agreement coming into force, while China would have faced a potential reduction in the volume of exports. However, had the TPP and its sister Trans-Atlantic Partnership been implemented, the Eurasian Economic Union (EAEU), which involves Russia, Belarus, Armenia, Kyrgyzstan, and Kazakhstan, would have found itself isolated in terms of trade and investment, said Evgeny Vinokurov, who heads the Center for Integration Studies at the Eurasian Development Bank. Now that the U.S. has withdrawn from the TPP, this gives Russia and the EAEU a chance to develop trade and economic ties with Asia-Pacific countries. As an EAEU member Russia already has a free trade agreement with Vietnam, one of the TРP signatories. In particular, Russian automotive manufacturers KamAZ and AvtoVAZ have reached agreements on localizing their production in that country. KamAZ reports that it managed to double the size of exports to countries outside the former Soviet Union in 2016, including thanks to deliveries to Vietnam, the company's largest market after the CIS. Russia is in talks on simplifying trade with other Asian countries. For example, an agreement on economic cooperation is being prepared with China. Even though that agreement does not provide for a reduction in customs duties, it is expected to simplify the mutual movement of commodities by lifting non-tariff restrictions and reaching agreements on mutual quality inspections. Moscow is also looking into the possibility of setting up free trade areas with Singapore, South Korea, and India. Apart from that, Russia is a party to the Asia-Pacific Economic Cooperation (APEC) forum, which is used as a separate platform for free trade area talks. China, for its part, will now have greater freedom in promoting its own Regional Comprehensive Economic Partnership (RCEP) project, said Alexey Portanskiy, professor at the Higher School of Economics and senior researcher at the International Economics Institute of Europe in the Russian Academy of Sciences. Portanskiy noted, however, that China's alternative may prove less comprehensive than the TPP would have been, because potential parties to it are so far actively protecting their markets.